Doing a battery pull (removing the battery) on a BlackBerry phone has been the most common way to fix common BlackBerry problems like screen freezes, cursor lagging and what not, or, more annoyingly, rebooting a BlackBerry phone has been the way to unwrap a newly downloaded app or to properly say goodbye to a recently deleted app. Why is it required to restart a BlackBerry every time an application is uninstalled or deleted? Question to be answered later I guess. I wrote this article to show you how to reboot a BlackBerry phone without removing the battery (or doing a ‘battery pull’ as it is often called). Although most people already know how to do a soft reset but that’s just most people. 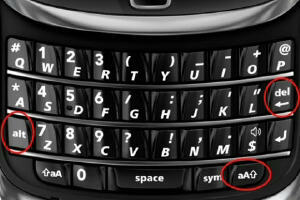 To restart your BlackBerry using only the keypad, you will need to press three buttons simultaneously, the key combination is ALT, SHIFT and DEL as can be seen from the image below. The SHIFT button is the one that has the characters aA on it with an upward pointing arrow. If there are two SHIFT keys on your keypad, you will be making use of the right one for soft resets (when I say right one, I mean the one on the right hand side), right. 3. Without letting go of both buttons, press and hold the DEL button. Voila.